01 Nov, 2017 by	Margaret M.
I don’t know who’s side to take in this story. On one hand, we have CNN and on the other we have a protest led by Laura Loomer, who has been written up in this publication for relentlessly mocking me for my medical condition when I questioned her fundraising strategies. Loomer recently made waves for threatening Canadian political commentor Lauren Southern with a lawsuit, when Lauren expressed concerned that Loomer engages in blackmail and sexual harassment, ending with New York conservative Gavin Wax posting a video online discussing the alleged harassment he’s received at the hands of Loomer. But let’s take a look at the protest itself, shall we? The jackals at CNN were broadcasting live from New York covering the massacre that was caused by an Allah Akbar-yelling assailant yesterday in lower Manhattan. Like I said, the protest was led by Laura Loomer who was working on the Las Vegas Massacre until recently. I assume she got bored and left. 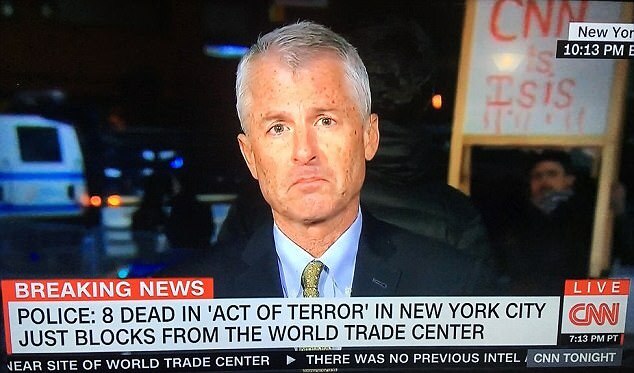 The protest showed up behind the CNN hosts including Anderson Cooper holding up signs that say, “CNN is ISIS,” which is not strictly true, but I understand the sentiment. Yesterday, eight people were killed by a man who was captured alive, but left behind a note citing that ISIS was the influence for his attack on innocent pedestrians. The man in question, Sayfullo Saipov, is a 29 year-old Uzbek national who was legally able to enter Obama’s America in 2010. Online social media channels that have only positive things to say about ISIS have been praising Saipov’s attack and calling him “brother.” So far, ISIS has not claimed any responsibility in the attack. Using a rented Home Depot truck, Saipov drove down 17 blocks on a bike path before getting back on the road and slamming into a school bus, jumping out of the vehicle allegedly waving fake guns before being shot in the stomach by an officer with the New York Police Department. Saipov worked as an Uber driver this summer and while some friends are saying that he was “very friendly,” the manager of his local supermarket called him “erratic” and claimed that he would berate and belittle the cashiers at the store, saying that he was “quick to anger” and “violent” and he would break soda cans and argue over the price of things. Trump was entirely right to call CNN and other channels “fake news,” so video (below) of the protesters chanting FAKE NEWS! is certainly reasonable.